Comments: Prairie voles are a major food source for many of the large, predatory mammals of Kansas. These mice have black and white "peppery" fur with a yellowish tinge on the belly. They construct runways at the soil's surface where they forage during the night then retreat to a network of tunnels below ground to store collected food. Females produce about four litters of 3-4 young per year. Their average life span is less than a year. Distribution: Prairie voles range throughout the prairies of the United States and Canada. They are found in large numbers in grasslands and fallow croplands throughout Kansas. 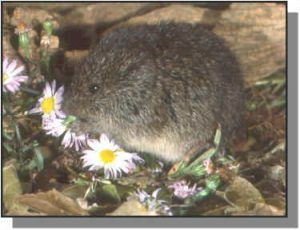 Food: Prairie voles feed on grasses, forbs, seeds, roots, and rhizomes.